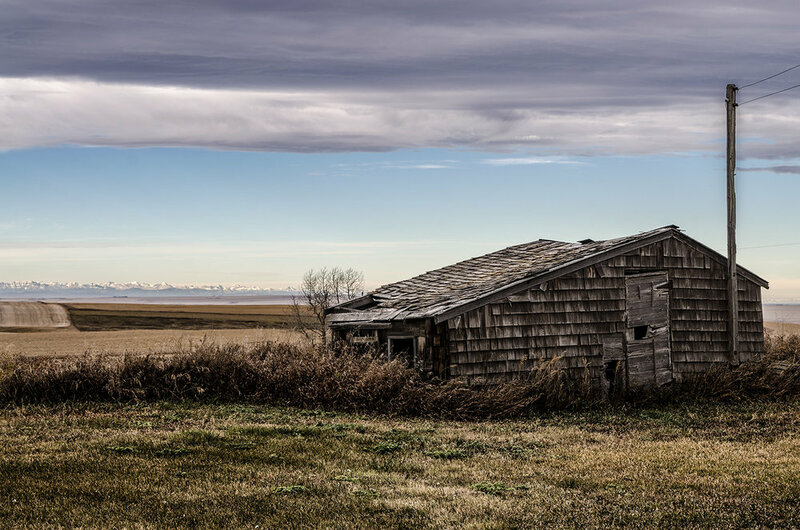 The gambrel roof barn in this post was built in 1934 and gradually fell out of use in the 1980s. The current owners, who have been living here since 1972, tell me that the original builder's brother built a gothic arch style barn just down the road in an attempt to outdo his brother. Both are very handsome barns but, in my opinion, the effort in one-upmanship was a success. Inside a gambrel roof barn, you will find at least one gambrel used for hanging carcasses at butchering time. The word comes from the hock of a horses leg. The bend in the leg resembles the bent rafter line of a gambrel barn roof. These roofs provided more storage in the hayloft when compared to a gable roof or A-frame. A gambrel roof barn is usually an indication of European influence. 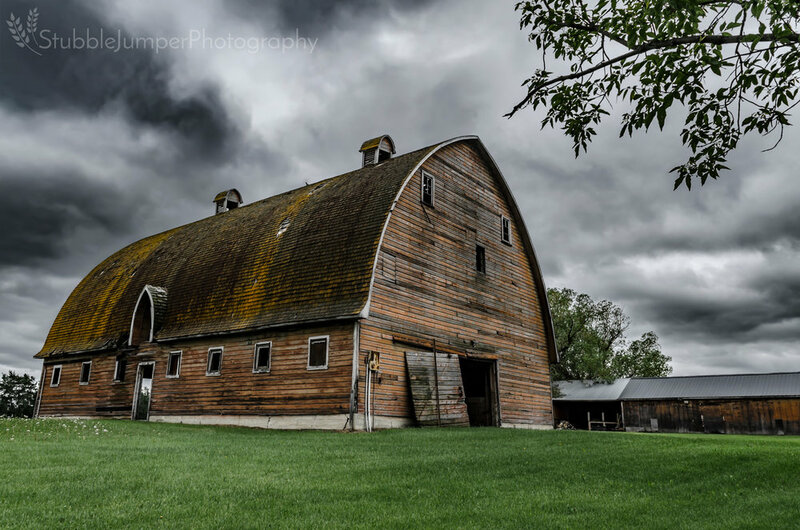 Gothic arch (pointed arch roof truss) barns evolved from the gambrel roof design and provided even more storage capacity by allowing for large, open haylofts with no supporting columns in the middle. The graceful contours of a gothic arch barn were thought to increase the value of a farm. A complete kit could be ordered delivered to the nearest train station. The kits included floor plans, pre-cut lumber, and all hardware needed to assemble the family's new barn. In 1920 Sears-Roebuck offered the “Cyclone,” a gothic arch style barn, starting at $530.00 for the 24x24 foot model. The largest Cyclone barn was 40x140 feet and could be had for $3418.00. In 1916 Sears-Roebuck advertised their Barn No. 60, a 32x62 foot gambrel-roofed barn for $945.00. Francis Kingsbury opened the Kingsbury post office in 1904. It was located in his home, one and a half miles south of the hamlet of Kingman, where he lived with his father (a widower) and two brothers. In 1909 the post office was moved into Kingman. As there was another post office in the province called Kingsbury, the post office changed its name to Kingman to avoid confusion with mail delivery. Lots in Kingman went onto the market October 19, 1909, at 10:00 am. In short time, Kingman had two general stores to serve the new residents. The first was owned by Taje & Olson Company of Bawlf. The second, directly across Main Street, was occupied by A. Horte and Sons (later becoming the International Store). In February 1910 the first passenger train on the Tofield-Calgary branch of the Grand Trunk Pacific railroad stopped at the Kingman railway station. During its first years, Kingman experienced extensive growth. The community laid claim to a doctor's office, a real estate office, a dressmaker, a grain buyer, a farm machinery warehouse, and a restaurant, where a full course meal was had for 35¢, or coffee and pie for 10¢. The construction of a Hogg & Lytle grain elevator began in July of 1916. The 40,000 bushel elevator was ready for business in August of that year. In September of 1926, the Home Grain company purchased the elevator, continuing operation until it was acquired by Searle Grain Company in the spring of 1929. 1940 saw an annex added. Sometime in the early 1970's Searle sold the elevator to the Federal Grain Company, who in turn, sold it to the Alberta Wheat Pool a few years later. The elevator was dismantled in about 1975. A United Grain Growers (UGG) elevator, with a 35,000 bushel capacity, was completed and ready to handle grain for the 1922 harvest. During its first year of operation, the UGG handled 60,000 bushels. Kingman's UGG elevator was demolished in March 1976. 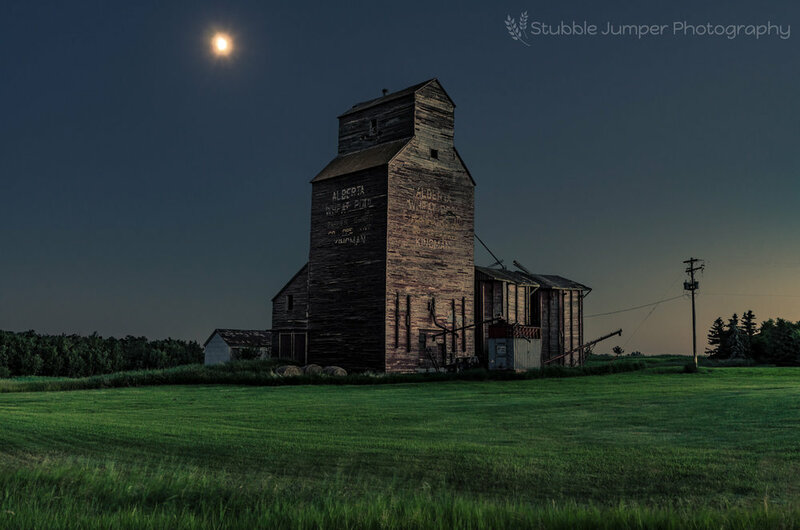 Kingman's Alberta Wheat Pool grain elevator was built in 1928 with a 40 000 bushel capacity. Two 15 000 bushel annexes were added in 1941. By the 1960s things in Kingman began to slow down; businesses closed and people moved away. In the mid-1960s rail service was discontinued; the tracks removed in 1978. In the late 60's the train station was relocated to Dodds where it was used as a dwelling. Sadly, it burnt down a few years later. The International store was the last remaining general store in Kingman, closing its' doors in 1971. 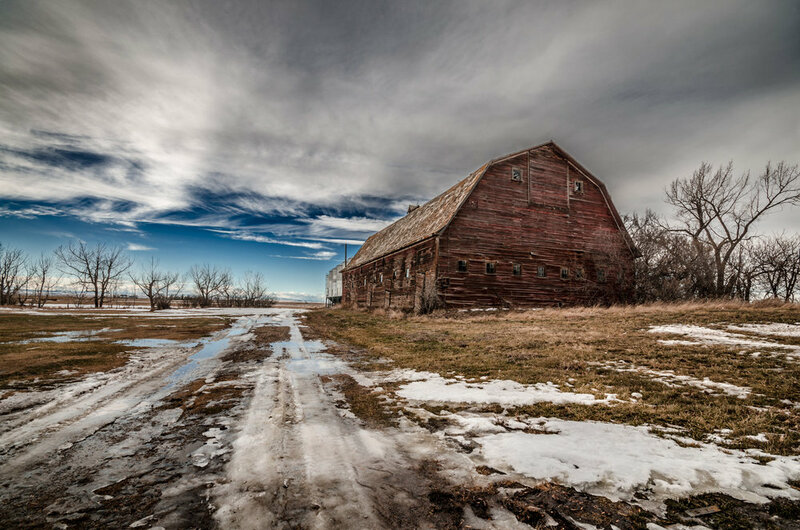 On February 15, 1977, the last grain elevator in Kingman was moved to a private farm. It took ten days of preparations and loading to ready the 200-ton structure for transport. It was transported with a modified former WWII tank carrier. The 8 mile move took six and a half hours. Today Kingman has a school, post office (in the former International store building), museum, community hall, and an outdoor skating rink. Kingman celebrates its Scandinavian roots with an annual Lutefisk Supper. The 2017 supper saw a turnout of over 400 people. 1927- Kingman hall built. First dance held in January, 1928. 1928- Cafe built on the site of Horte & Sons store that was destroyed by fire. 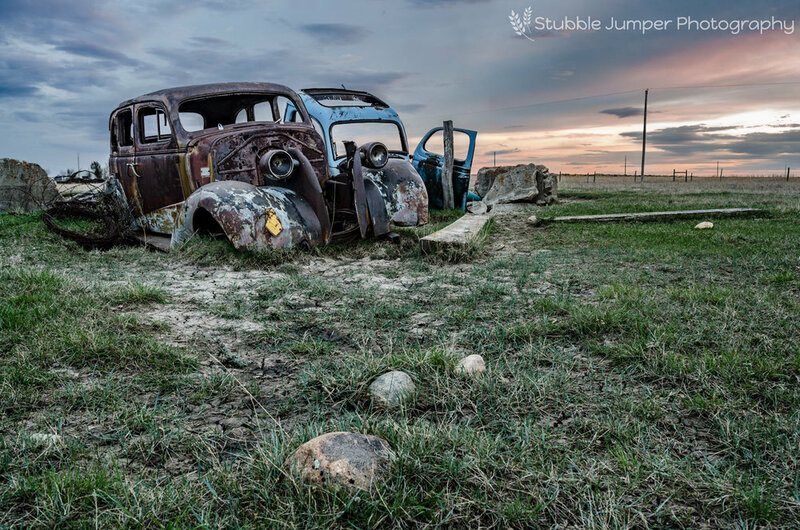 A blackbird sits perched on this 1937 Chevrolet Master, taking in another spectacular prairie sunset. 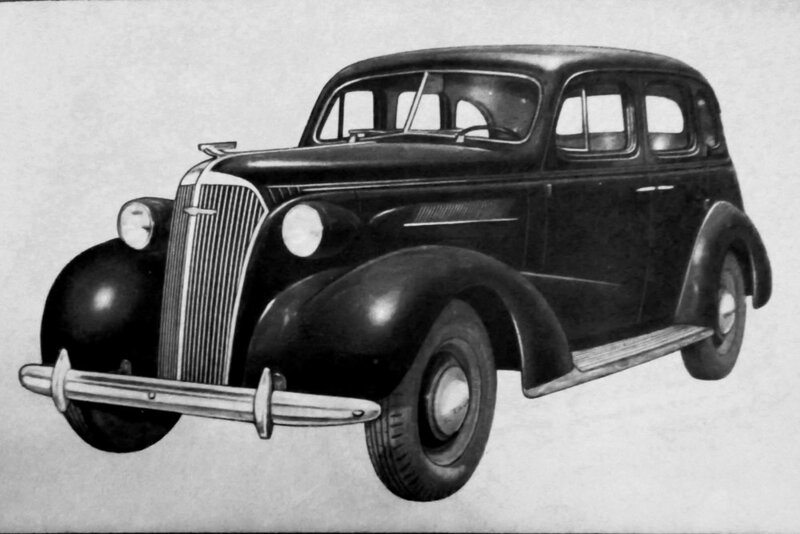 For the 1937 model year Chevrolet introduced it's most complete redesign since 1929. Bodies were wider, roomier and now made completely of steel marking the departure from using wood in the body's construction. The Chevrolet is a 5 passenger sedan with trunk that cost $817 when new. It was equipped with the 216 cubic inch Blue Flame inline six cylinder that made 85 horsepower. The Master Deluxe model cost $70 more than the Master. Upgrades included dual taillights, two windshield wipers, better upholstery, an engine temperature gauge, a lower axle ratio, and most notable was the 'knee action' independent front suspension. This was the last body style where cars and trucks shared a similar appearance. 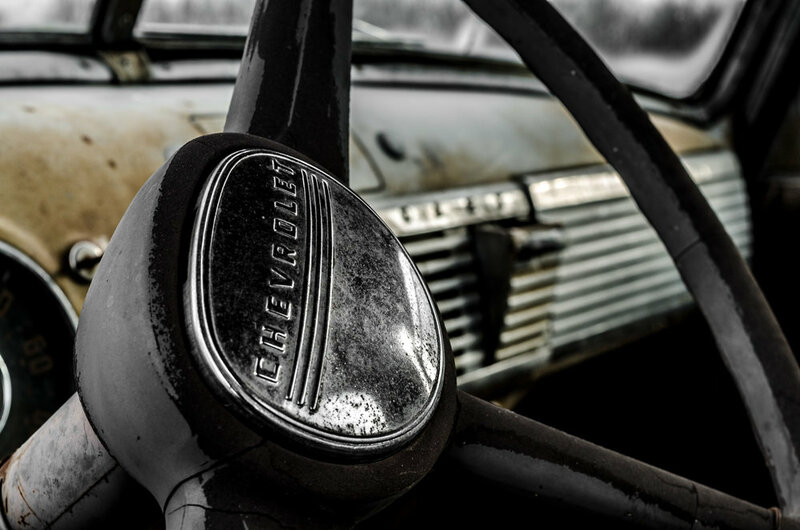 While working under America's Car Design Pioneer, Harley Earl, Jules Agramonte and Lewis Simon were responsible for the 1937 (and '38) Chevrolet's styling. Understated details made the Chevrolet stand out from its competitors. The 'diamond crown speedline', a body crease sweeping back from the front fenders down into the doors, gave the car an extended body look. The 1937 Chevys are still considered some of the most beautiful cars ever made. Here are one and a half late 20's Buicks, resting temporarily before they become yard art. Automobiles revolutionized personal transportation in the 1920s. Throughout the 20s cars became more accessible and affordable, dawning the 'oil age' in Canada. In the late teens the Calgary Auto Club assisted in the formation of 25 automobile clubs in Southern Alberta. Edmonton, Lethbridge, and Medicine Hat also assisted in forming auto clubs in communities near the urban centres. The clubs worked toward the further development of highways and good roads throughout the province. 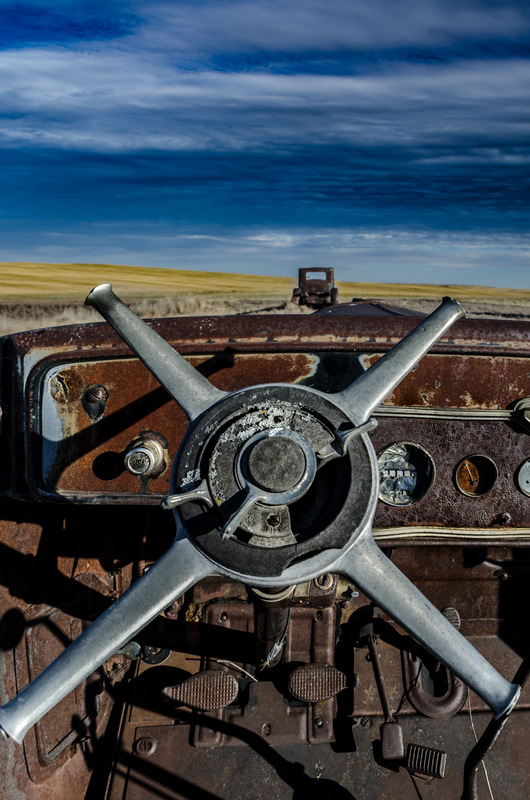 By 1929 a total of 833 miles of highway had been graveled. The popularity of the automobiles gave rise to a thriving do it yourself car repair industry. Canadian Tire being one of the more notable companies, started in Toronto in 1922 and has grown to become one of Canada's largest retailers. This barn was built in 1912 and only fell into disuse about 10 years ago. The builder's grandson still lives on and farms the same land that his ancestors made their living on. Only one of the wooden cupolas still survives on the roof of this very large barn. 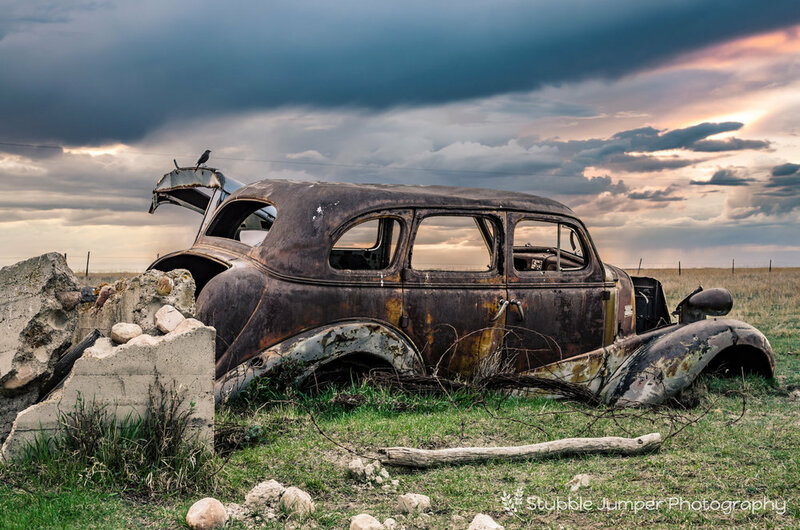 What I believe to be a 1948 Maple Leaf badged Chevrolet sits in the farm yard. My research (which may be flawed) tells me the 1947-53 Chevrolet pick ups known as the Advance Design series were the last body style to carry the Maple Leaf badge. 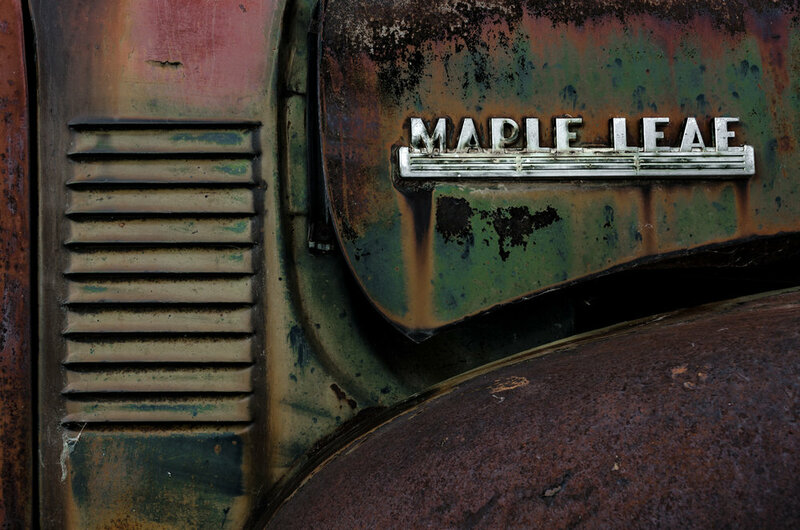 Maple leaf trucks were built in Oshawa, Ontario from the 1930s until the 1950s. Right hand drive models were made in Canada and assembled by Holden in Australia. Canada, Australia and other British Commonwealth countries put high tariffs on US built products because the US didn't import much from them. Having a Canadian made truck allowed GM to offer trucks at a more affordable cost. 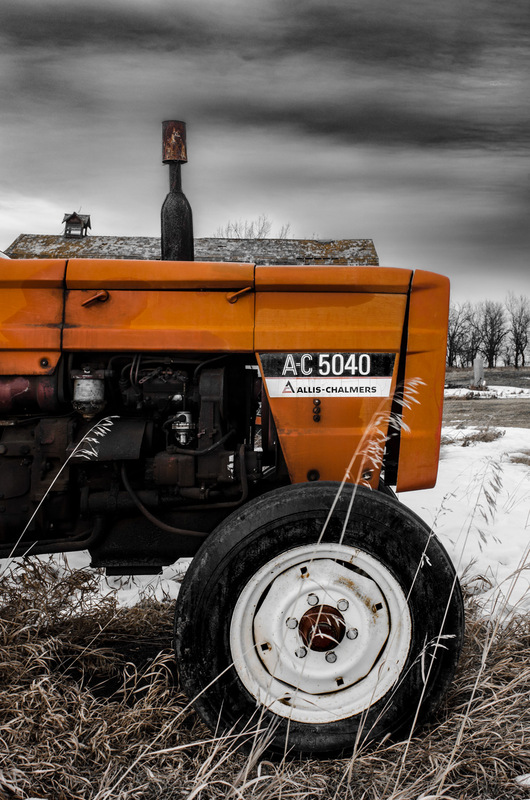 An Allis Chalmers AC5040 2 wheel drive tractor also sits on the property. These were manufactured in Romania from 1976-1980 with an original price of $9823USD. They were equipped with a 3 cylinder diesel that made 35 horse power. The current landowners acquired this property in 1960. By that time all of the buildings had fallen out of use. By the late 1970's the house and other buildings had to be demolished after descending into disrepair due to vandalism. 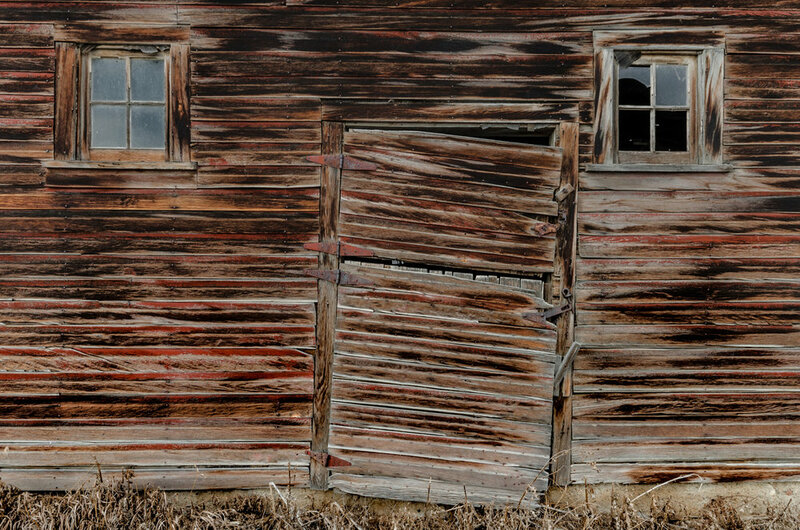 The shed on the side of the barn looks ready to fall but, the barn itself appears remarkably stable from the outside. 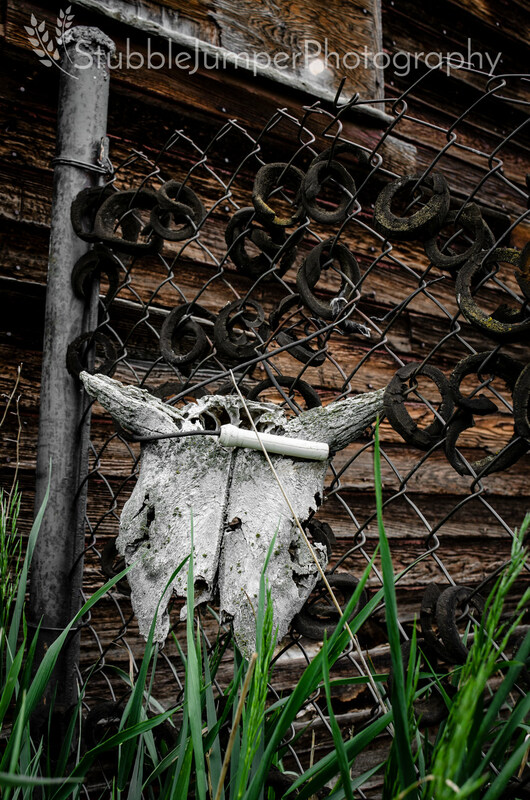 It is believed that the barn was built sometime between 1905 and 1910. 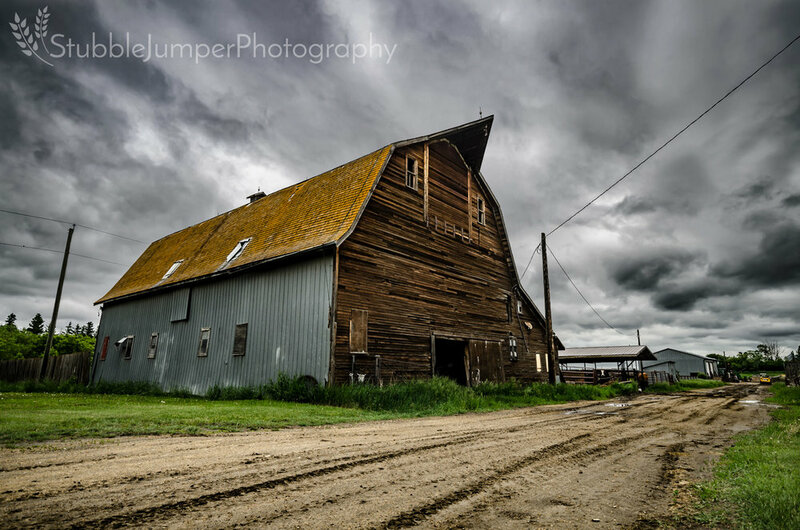 Here is another great Southern Alberta barn. The owner tells me it is at least 100 years old and hasn't been in use for quite some time. It is strange to see so many newer vehicles abandoned behind the barn. I wonder if any will ever become as collectible as the vehicles we currently consider classics? This is the book mentioned in my last post - 'Woodley Barn'. Published in 1938 'Our Country And Its People' was part of grade 7 Social Studies in Alberta schools. The authors wrote of Canada's natural beauty, our abundant resources, the settlers and their homelands. It is interesting to read about our history from a past perspective. 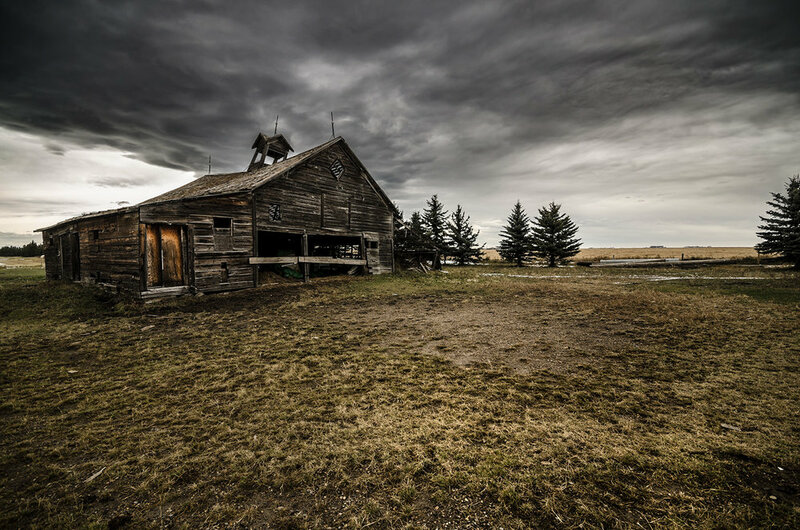 With the rocky mountains stretching across the western horizon, this barn and house were built in 1912 on a scenic piece of the Alberta prairie. The current owners, the Woodleys, acquired the land in 2010. They were happy to let me take photos, creating memories of a structure that may fall after a couple of heavy snows. They gifted me a book that was found in the house titled “Our Country And Its' People” by W.D. McDougall and Gilbert Paterson . Inside the book, I found clippings containing information on some of the animals that were found in the area. I can imagine the owner studying the area before his long, difficult journey to the place he and his family would call home for generations to come. The Woodleys purchased the land from an elderly lady who didn't have any remaining family, so many of the details are now lost to time. This magnificent barn was built in 1925 by Walter Mays, a carpenter originally from England. It was home to a half dozen milk cows. The current owners still use the barn today, mostly for calving. Their parents acquired the property in 1948-49. A pair of great horned owls roost under the hay loft peak during the day. They have returned every year for the last five years, nesting in the nearby trees. The first thing that caught my eye were the ornate cupolas on the roof. Their purpose is to provide ventilation for the fodder stored in the hayloft, preventing it from molding or catching fire. Originally cupolas were made of wood but, by about 1910 most were manufactured from galvanized steel. 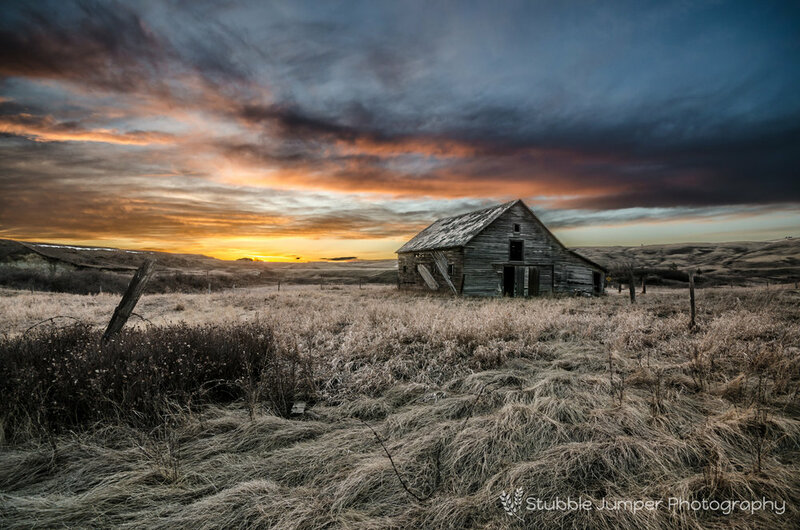 For many years I have enjoyed photographing old homesteads and landscapes found on the Alberta prairie and surrounding area. During this time I have seen many structures fall to the ground, never to be seen again. I have decided to gather as much history as possible on these subjects and share them with you on this blog. These historic structures are disappearing from our landscape, I feel that photographing them is an important form of preservation, meant to honour the structure's existence as well as those that built and cared for it. Barry Broadfoot wrote a book titled 'Next Year Country : Voices Of Prairie People'. One sentence has really stuck with me over the years. He says that “Every old home place in the west today is a monument to their (the settlers') determination”. If it wasn't for our forefather's hard work and perseverance we wouldn't enjoy many of the comforts that we have today. If you own or know of any historic structures that you would like to share please contact me so that we can arrange a photo shoot.